The combination of role-plays, illustration, video and examples from Specialisterne NI practice, helps make the workshop immersive and enjoyable. – Provide opportunity to practice: Participant coaching: participants have opportunity to interact with professional actor role playing composite characters based on actual work experiences. Note: The Level 2 workshop builds on the learnings from the Level 1 workshop. Refreshments will be provided at both sessions and a light lunch will be provided for those attending both sessions! Payment is due 7 days prior to the training. The names of participants attending can be changed at any time. Note: A Level 1 Workshop is available to book for the morning session. 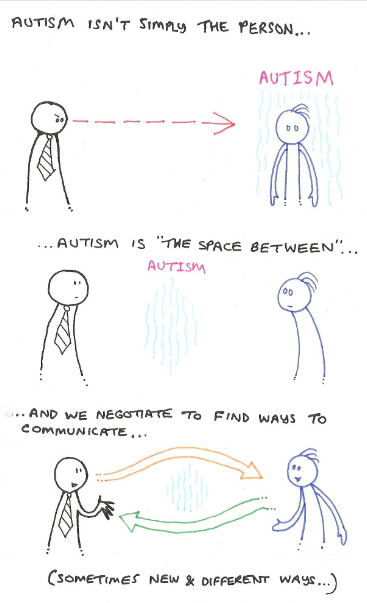 Specialisterne NI has developed 1/2 day training workshops for adults on the Autistic Spectrum. Training workshops inform participants of common experiences of people on the Autistic Spectrum who are studying, job-seeking or working in graduate level roles. We are now delighted to offer this training online and places can be booked for one-to-one online training or places on small group online workshops. The workshop is interactive and draws from Specialisterne NI practice as well as being informed by existing theories of Autism. Training is delivered by Specialisterne NI team, all of whom have studied a MSc Autism and have daily experience supporting talented people on the Autistic Spectrum and employers. https://www.specialisterneni.com/about-us/). In the workshop you will view a range of communication scenarios: at interview, at college or in the workplace, and we will consider potential reasons behind the communication, as well as ways of making communication better. Having worked with employers for over 13 years, and having supported over 200 people on the Autistic Spectrum who are job seekers or currently in work, we hope this experience will help you be better informed to prepare for work, job seek or to perform a work role.